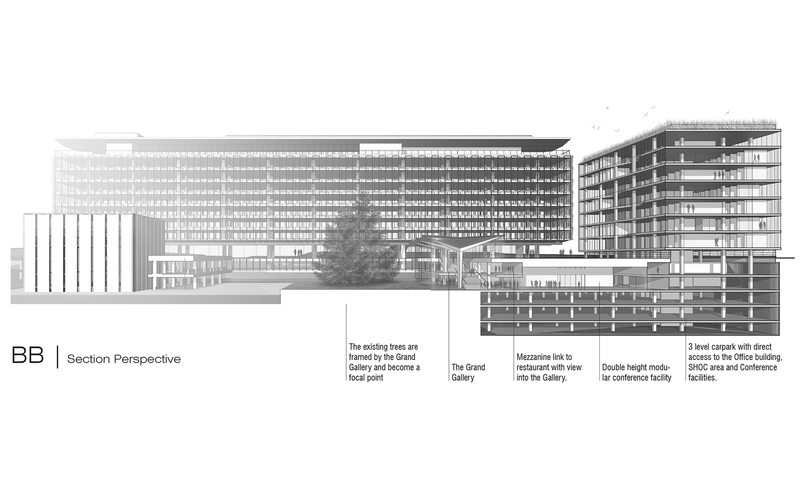 Architectural design competition for a new building at the World Health Organisation headquarters in Geneva. 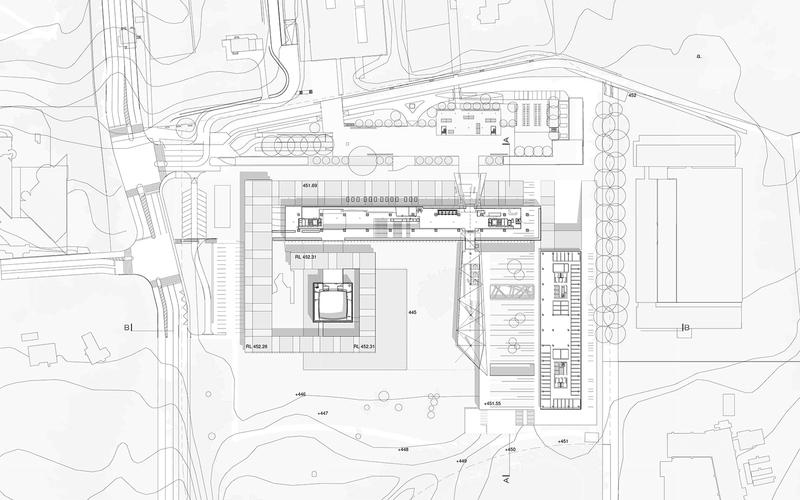 The proposed extension respects, celebrates and enhances the architectural heritage of the site through the scale of its components and restrained expression of its architecture. 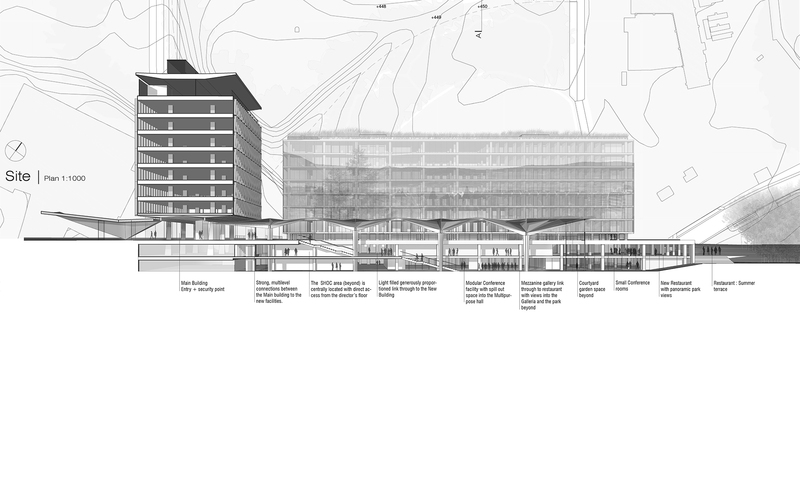 The proposal comprises of a new podium, an office building and a galleria that combine with the existing buildings to create a harmonious composition. The buildings step up in scale and a roof garden on the New Building completes Tschumi’s original gridded landscaping spiral. 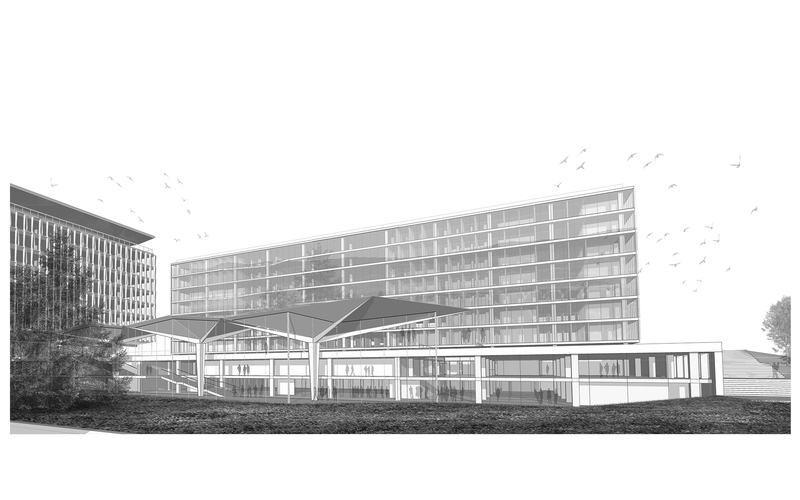 The floating triangulation of the existing entry canopy is reinterpreted to the south of the Main Building creating a new Galleria space around which the project is organized. The user passes through the Main Building into the new volume stepping down along its length to access each key element of the program. An expressive and light filled space, it is central to the project and encourages interaction and communication offering panoramic view of the existing architecture and landscaped park. This new social hub provides direct multilevel access from the existing building through to the SHOC area, Restaurant, Conference facilities and the new office building. 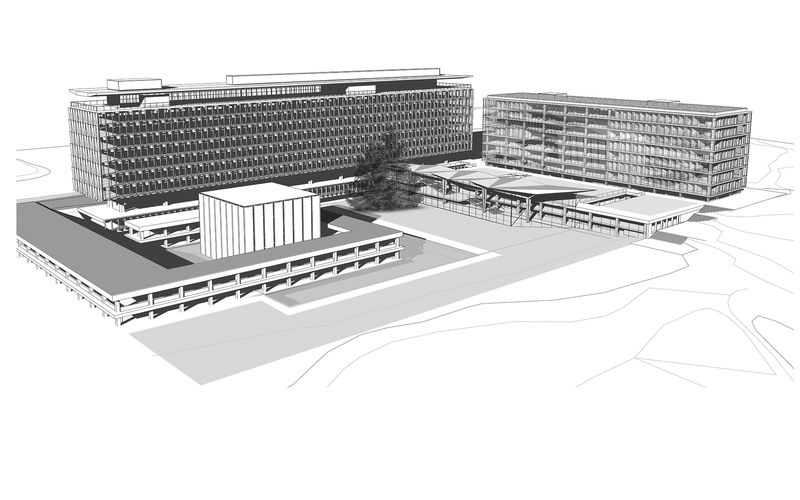 The New Office Building is intentionally understated and slightly lower in height allowing the Main Building to continue to dominate the site. The new podium pushes up from the park – lifting the landscape up to the entry level of the Main Building. Courtyards and a light wells punctuate the podium bringing natural light deep into the spaces helping to clearly define each zone. The SHOC area is at the heart – directly accessible from both office buildings and the underground carpark. Further down, Conference facilities spill out into the multi purpose function space while the mezzanine Restaurant offers sweeping views of the site and provides access to an outdoor terrace area. The office building provides rational, flexible and functional spaces. It is detached from the podium to give a sense of privacy to its users and in doing so brings its floor levels in line with the existing Main Building – contributing to the overall sense of unity of the composition. The increased ceiling height under the office tower also allows for high level light into the kitchen preparation areas and natural ventilation of technical rooms. A double skinned facade system gives optimum thermal control – active response to changing environmental conditions. Possibility to integrate photovoltaic power generating facade. A Compact and rational floor plate increases the buildings efficiency – economy of materials and lifetime running costs. Construction materials are locally sourced and recyclable. Winter garden atrium spaces are created by detaching the internal skin of the facade – also generating social hub opportunities. Roof gardens improve the thermal properties of the tower and podium also providing an attractive outlook when viewed from above. Full height glazing combined with courtyards and winter gardens omptimises light penetration.